Freedom House is an international non-governmental organization based in Washington, D.C. that conducts research and advocacy on democracy, political freedom and human rights. The organization was founded by Wendell Willkie and Eleanor Roosevelt in 1941. It publishes an annual report assessing the degree of perceived democratic freedoms in each country, which is used in political science research. On Freedom House’s summary table, among those listed as “Free”, with a score of 1.5 (the second highest score), is Israel, who shares this same numerical ranking with nations such as Italy, Japan, and Greece. Among those listed as “Not Free” – most of which are Muslim states – are: the Palestinian Authorities, Jordan, Egypt, United Arab Emirates, Iran, Libya, and Sudan. Trailing them all are North Korea and Uzbekistan, who are among the very worst human rights violators. 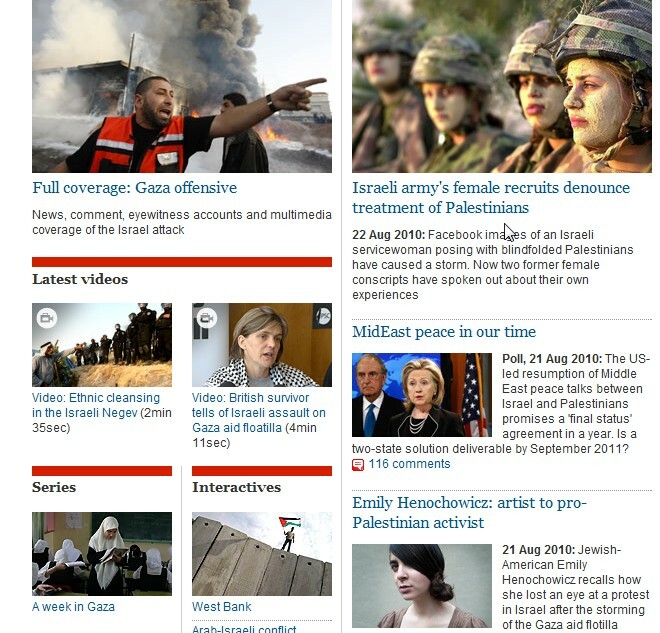 From left to right, we see a large photo accompanying their link to CiFs coverage of “Israel’s attack” on Gaza – a war which took place over a year an a half ago; A story on female IDF soldiers “speaking out” about the alleged mistreatment of Palestinians; A video installment entitled “Ethnic Cleansing in the Negev”; A flotilla related story which includes a video interview of a woman who was on board the Mavi Mamara, who they refer to as a “Survivor” of Israel’s assault; a CiF poll on whether readers think there will be a Palestinian state created by 2011; A link to “A Week in Gaza” with a photo, presumably, of religious Muslim women in Gaza, seemingly free and unburdened; a section called “Interactives” which is accompanied by a photo of a lone Palestinian figure atop Israel’s security fence waving a Palestinian flag in seeming defiance; and a photo of a Jewish pro-Palestinian “activist”who was injured after protesting the flotilla incident. So, I also decided to check out CiFs coverage of the worst human rights violator, according to Freedom House, the Central Asian Republic of Uzbekistan, and this, after a bit of searching, is what I found. 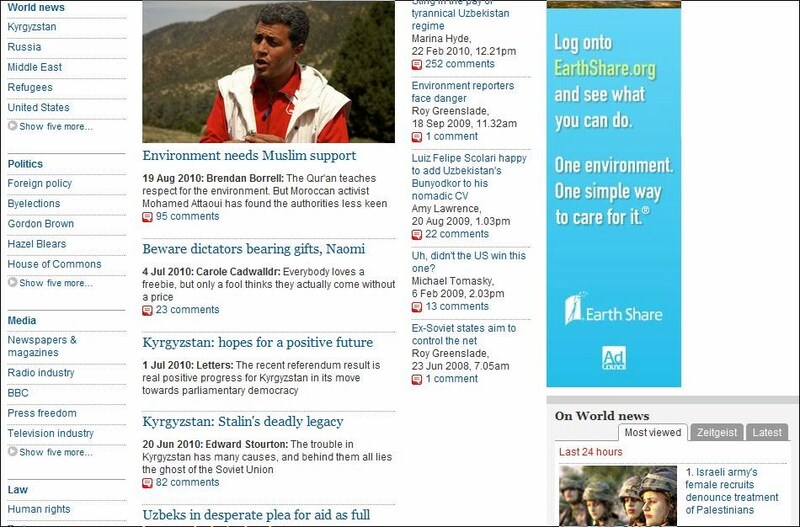 The page (which included as much coverage on Kyrgyzstan as its neighbor Uzbekistan) includes, as its lead story, a report on environmental activism in the Central Asian Republic entitled, “Environmentalism needs Muslim Support.” There were a couple of stories which only mentioned Uzbekistan in passing, and, one – that’s right, one – story specifically centered on, and negative to, Uzbekistan: “Sting in the pay of tyrannical Uzbekistan regime” – a story which linked to their Culture Blog, and really focussed on the popular singer, Sting, who received more than one million dollars to perform for the Uzbek dictator’s daughter. Uzbek’s dictator, Islam Karimov, has been reported to delight in such activities as boiling his enemies, slaughtering his poverty-stricken people when they protest, and conscripting armies of children for slave labour. All of this is, more or less, true. But for some reason you neglect – even to mention the existence of , by the very choice of PDFs that you link to-Freedom House’s report, in the same survey, of the Israeli-occupied territories (i.e. West Bank, Gaza, East Jerusalem, Golan), which is not so gushingly complimentary about the “freedom” offered the populace by their masters there. I wonder why that might be? Petr V – the ‘not free’ status of the territories is in accordance with the Oslo Accords signed by Israel and by Arafat and the current PA Chairman, Abbas. This is something that Freedom House has neglected to mention. Let us hope that the Palestinians show more patience than awareness of their dignity this time and respond to peace offers – something that they have neglected to do in the past. All of which goes to show the Israeli and Western Left’s real concern is not with human rights but rather with Israel. You would see them denouncing the very worst human rights violations elsewhere on earth. They aren’t and that speaks volumes about their single-minded obsession with Israel’s alleged sins. @normanf ‘All of which goes to show the Israeli and western lefts real concern is not with human rights but rather with Israel’. Is that ALL of the Israeli left and ALL of the western left that you are tarring with your giant brush? E.g. treatment of citizenship of Arabs in East Jerusalem, differential status for the Druze in Golan, etc. Sure, it doesn’t change the overall situation (of course Israel is far freer, in probably every sense than the extremely brutal and murderous regime in power in Uzbekistan or the dictatorships or pseudo-dictatorships that exist in all of the Arab state at the present time), but it would have been nice to see even a small acknowedgement that not everything is rosy in the Israeli garden in the original report. Just for reasons of credibility and balance. …but it would have been nice to see even a small acknowedgement that not everything is rosy in the Israeli garden in the original report. Just for reasons of credibility and balance. This article never considered Israel and the Israelis perfect. Its subject is the obsession and deligimitization campaign of the Guardian – they hardly mention these hellholes like Burma, North-Korea, Pakistan etc. but every day they have something bad to say about the wrongs of Israeli democracy. With respect, Peter the Hungarian, that’s nonsense. In an average year of later there is probably more news coverage of Pakistan in the PRINTED version of the Guardian, both in terms of words and space than of any other foreign country. (Afghanistan, Iran and Iraq being shortly behind). Probably with good reason. And they hardly shy from their responsibilties as liberals in exposing other tyrannies, either. 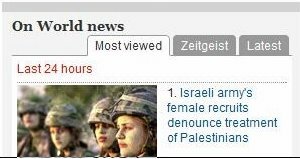 To claim that the Guardian is “obsessed” with Israel strikes me, in itself, as a sign of monomania. The name of this blogsite is CifWatch. CIF – Comment Is Free is not in the printed edition and you are kindly invited to check the relevant statistics – they can be found on CifWatch too, simply I don’t have the time to look them up. On Cif the number of articles painting Israel black is simply out of all proportions comparing it with similar articles about the “non free” countries. There is no differential status for the Druze in the Golan. They are free to take up Israeli citizenship if they so wish (around 10% have) or to keep their status as Syrian citizens if, for their own political reasons, they chose to do so. Despite this they enjoy exactly the same rights as any other Israeli citizen including health care and education. In fact they have a higher proportion of university graduates than the Jewish Israelis in the Golan. They run their own local council and are free to practice their religion. Their religious leaders are permitted to travel to Syria and Lebanon for important events in their religious calendar. Petr v You seem to believe that Jerusalem Arabs are barred from Israeli citizenship — if not, your comment is rather obscure. The truth is that Jerusalem Arabs who were Jordanian citizens were offered Israeli citizenship and that the offer is still open. Every time that there are peace talks there is a huge rise in the rate of application for citizenship from people who have become accustomed to living under Israeli rule, with excellent health care a prosperous economy and an orderly way of behaving. Uzbekistan is the most repressive regime in the world and because USA is having a new flirtations with the Uzbek Government so every thing and every torture is being ignored. I was my self detained for 124 days from 10th December 2009 till 12th April 2010 and Inspite of every effort I have not been able to know why? It seems to be the Guardian’s intention to continue to maintain postings of anything to do with cast lead and the mavi Marmara indefinitely on that web-site. Unlike, for example, Sri Lanka, or Pakistan, or Darfur, or Congo, etc. They are determined to maintain their incitement for as long as they can.